Michael Ilitch Sr. was born on the 20th July 1929 in Detroit, Michigan, USA of Macedonian ancestry, and is an American businessman, best known for being the founder of the third largest pizza chain in the USA – Little Caesars Pizza, which is the main source of his wealth. He is also recognized as the owner of the MLB Detroit Tigers and the NHL Detroit Red Wings. His career in the business industry has been active since the 1950s. Have you ever wondered how rich is Mike Ilitch? According to estimates from sources, Mike counts his net worth at the impressive amount of $4 billion as of early 2016. Obviously, most of his income is the result of his successful involvement in the sports industry, as the owner of two great American sports teams, and from owning one of the largest international fast food chains. He is also known as the owner of the Fox Theatre and Olympia Entertainment, which has also added to the overall size of his wealth. Mike Ilitch was raised in Detroit by his father Sotir and mother Sultana Ilitch, immigrants from Macedonia. After graduation from the Cooley High School, Ilitch decided to join the US Marine Corps, where he served four years. Immediately after returning home, Ilitch’s net worth firstly began to increase as he became a baseball player with the Detroit Tigers in 1952, when he signed a contract with the club for just $3000. Unfortunately, his career was relatively short-lived, as he suffered a devastating knee injury, and had to retire from professional baseball. Mike Ilitch then decided to start a small pizza business, with his wife, and he opened Little Caesars Pizza Treat in Garden City, Michigan. In no time, his business became one of the largest pizza chains in the USA, behind Pizza Hut and Domino’s Pizza. Little Caesars Pizza Treat also holds restaurants outside the USA, including in Puerto Rico, Peru, Turkey, Saudi Arabia, and numerous other locations. Over the years, it became the main source of Ilitch’s net worth, and it has also enabled him to expand his area of business to sports. Through the years Mike Ilitch has bought several franchise clubs in various sports. He formed the Detroit Caesars, a softball team, but the team ceased to exist as the league folded in 1979. Afterwards, Mike bought the Detroit Red Wings in 1982 for $8 million, and from a losing team, created Stanley Cup Champions, and the success of the team also added to Ilitch’s net worth. In 1992, Mike Ilitch expanded his ownership to baseball, buying his former team, the Detroit Tigers, but in first 13 years of his ownership, the Tigers couldn’t praise themselves with great results, however, that eventually all changed, and the Tigers became one of the best teams in baseball. In addition to this, Mike was also the owner of the Detroit Drive, an indoor football team, but eventually sold the team, a few years after he bought the Detroit Tigers. Thanks to the success of the Detroit Red Wings, Mike was inducted into the Canadian Hockey Hall Of Fame in 2003, and also into the United States Hockey Hall Of Fame in 2004. Additional to Ilitch’s direct businesses, he founded in 1999 a company named “Ilitch Holdings, Inc.”, which has provided professional and technical services to all companies owned by him. Meantime, Mike Ilitch is also a noted philanthropist known for founding in 1985 the Little Caesars Love Kitchen, which helped hungry people during national disasters. Thanks to this program, more than two million people have been served. Ilitch also founded the Little Caesars Veterans Program, for which he received the Secretary’s Award in 2007 from the USA Department of Veterans Affairs. Beside that, he is known for The Little Caesars Amateur Hockey Program, which he founded in 1968, Ilitch Charities for Children established in 2000, and the Mike Ilitch School of Business. Regarding his personal life, Mike Ilitch is married to Marian, with whom he has seven children, with their son Christopher working as the CEO of Ilitch Holdings, Inc. In 2008, the Ilitch family became only the fifth honored in receiving the keys to Detroit city from Mayor Kwame Kilpatrick. 1 Ilitch Holdings family member - Little Caesars Pizza, Detroit Tigers, Detroit Red Wings, Casinos, Hotels, Arenas, Theaters, Real Estate and others. 2 Founded/owns Mike Ilitch Jr. Productions, MICA Entertainment (Finance - Production), ITS Capital (Finance - Film Tax Credit), Prelude Pictures, P&A Funding and others. 3 Formerly ran the consulting firm Prelude Worldwide Ministries with co-"Lost in Space" producer, Mark Koch. 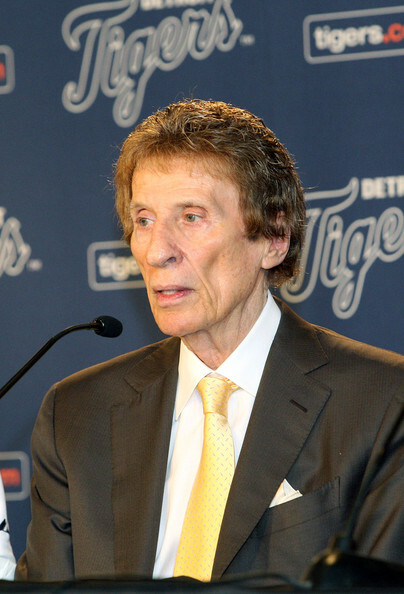 4 Son of Little Caesars Pizza, Detroit Tigers, and Detroit Red Wings owner Mike Ilitch. Mojave 2015 executive producer - as Mike Ilitch Jr.
Pawn Sacrifice 2014 executive producer - as Mike Ilitch Jr.